F Anders Lövdahl (Calgary, Moose Jaw, Lethbridge, 1999-2001) has signed for the rest of this season with Grästorp (Sweden, Division 1). This season, with Narvik (Norway, Division 1), he had two assists in two games, and he had three goals in four games with Kiruna (Sweden, Division 1). G Reto Berra of the Lake Erie Monsters scored a goal Friday night in a 5-1 victory over the host Chicago Wolves. If you haven’t seen the goal, it’s right here, and it’s worth watching if only for the celebration. . . . 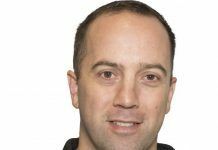 He is the 11th goaltender in AHL history to score a goal. . . . Former WHL D Dean Chynoweth, who also is a former WHL general manager and coach, is Lake Erie’s head coach. How much do concussions cost the NHL? Roy MacGregor of The Globe and Mail takes a look right here. His story includes a list of 35 players whose careers were ended because of concussions. This is frightening stuff. 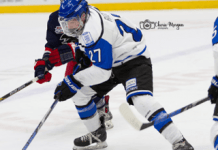 In Prince Albert, F Luke Philp scored twice to help the Kootenay Ice to a 5-2 victory over the Raiders. . . . Philp, who had scored the game’s first goal, broke a 1-1 tie at 5:46 of the third period with his 20th goal of the season. . . . F Sam Reinhart had two assists for the Ice. 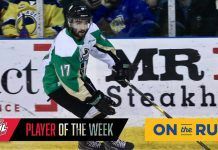 He’s got 285 career regular-season points, one shy of the franchise record held by F Jarret Stoll, now of the NHL’s Los Angeles Kings. . . . Ice F Jaedon Descheneau scored his 22nd goal and added an assist. . . . F Tim Vanstone had two assists for the Raiders. . . . The Ice (22-21-1) had lost four in a row. . . . The Raiders (19-24-1) had a three-game winning streak end. . . . The Ice holds down the Eastern Conference’s last playoff spot and the Raiders now are six points off the pace. . . . 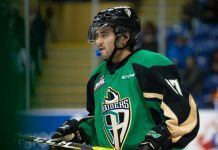 The Raiders are at home to Medicine Hat tonight, while the Ice visits Saskatoon. . . . Jeff D’Andrea of panow.com has a game story right here. . . . In Swift Current, G Landon Bow tied a franchise record as he stopped 24 shots and led the Broncos to a 5-0 victory over the Moose Jaw Warriors. . . . That was Bow’s sixth shutout of the season. He now shares the franchise record for most shutouts in one season with Mark Friesen (2010-11). . . . F Glenn Gawdin scored twice, giving him 12 goals, while F Jake DeBrusk got No. 24 on a second-period PP. . . . F Jay Merkley scored his 11th goal and added two assists, while D Max Lajoie and F Andreas Schumacher each had two assists. . . . The Broncos (21-19-5) halted a three-game skid (0-2-1). . . . The Warriors (18-24-4) had won two in a row. . . . The Broncos entertain Brandon tonight. . . . The Warriors are at home to Lethbridge tonight. . . . In Saskatoon, D Nolan Reid broke a 4-4 tie at 9:12 of the third period and the Blades went on to a 5-4 victory over the Medicine Hat Tigers. . . . Reid, a 16-year-old from Deer Valley, Sask., has one goal in 25 games this season after scoring once in two games last season. . . . Tigers F Trevor Cox gave his guys a 4-3 lead with his 16th goal at 16:34 of the second period. . . . Saskatoon F Brett Stovin tied it at 3:02 of the third, on a PP, with his second of the game and 15th of the season. Last season, he finished with 14 goals in 61 games. . . . The Blades had lost five straight games to the Tigers. . . . F Wyatt Sloboshan and D Brycen Martin each had two assists for the Blades. . . . Medicine Hat F Dryden Hunt scored his 17th goal and added an assist, while F Markus Eisenschmid had two assists. F Matt Bradley got his ninth goal and had an assist for the Tigers. . . . Saskatoon G Nik Amundrud stopped 42 shots, seven more than Medicine Hat’s Nick Schneider. . . . Saskatoon F Nikita Soshnin came up short on a third-period penalty shot with the game tied at 4. . . . The Tigers were 3-for-6 on the PP but gave up a shorthanded goal. . . . The Blades were 2-for-3 on the PP. . . . Saskatoon (11-29-3), which is at home to Kootenay tonight, has won two straight. . . . The Tigers (29-12-2) have lost two in a row. . . . The Tigers are in Prince Albert tonight. . . . Daniel Nugent-Bowman of the Saskatoon StarPhoenix has a game story right here. In Brandon, F Tim McGauley scored two goals and added three assists to lead the Wheat Kings to an 8-5 victory over the Lethbridge Hurricanes. . . . McGauley has 27 goals. . . . The Wheat Kings opened up a 3-0 first-period lead, only to have the Hurricanes pull even on F Ryley Lindgren’s first goal of the season at 10:28 of the second. . . . The Wheat Kings took control again when McGauley scored twice, at 14:55 and 17:17. . . . F Peter Quenneville and F Morgan Klimchuk also had two goals each for Brandon. Quenneville has 12 goals; Klimchuk, who reached the 100-goal plateau for his career, has 17 this season. . . . Brandon F Reid Duke scored his 12th goal and had two assists. . . . F Tyler Wong scored his 16th goal of the season for Lethbridge. . . . Brandon held a 57-21 edge in shots. . . . The Wheat Kings lost F Jayce Hawryluk to an undisclosed injury in the first period. . . . F Jamal Watson was among Lethbridge’s scratches. . . . F Brett Davis, a fourth-round selection in the 2014 bantam draft, made his debut with Lethbridge. From Oakbank, Man., he plays for the midget AAA Eastman Selects. . . . The Wheat Kings (32-9-4) have won three straight. . . . The Hurricanes (10-26-6) have lost three in a row. . . . Brandon will play in Swift Current tonight, while Lethbridge is in Moose Jaw. . . . In Edmonton, F Lane Bauer scored three times to lead the Oil Kings to a 6-2 victory over the Regina Pats. . . . Bauer has 16 goals; that was his first WHL hat trick. . . . The Oil Kings scored the game’s first six goals. . . . Edmonton D Blake Orban and F Cole Benson each had two assists. . . . Benson was playing his first game since Nov. 27 as he had been out with an undisclosed injury. He missed 16 games. . . . D Marshall Donald, who was acquired from Calgary last week, made his Edmonton debut and drew two assists. . . . Edmonton G Tristan Jarry made 28 saves. . . . Edmonton F Brett Pollock, its leading scorer, left in the third period with an undisclosed injury. After the game, Brian Swane of the Edmonton Sun tweeted that Oil Kings head coach Steve Hamilton said: “We’re waiting to get an update on (Pollock’s) situation, but hopefully it’s nothing too substantial.” . . . The Oil Kings, who are at home to Victoria on Sunday afternoon, improved to 22-18-5. . . . The Pats now are 26-15-3. They’ll play in Red Deer tonight. . . . 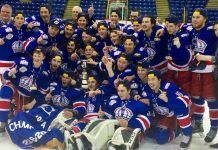 In Red Deer, F Austin Carroll scored the only goal of the shootout, in the seventh round, as the Victoria Royals beat the Rebels, 2-1. . . . F Greg Chase scored his 10th goal of the season to give Victoria a 1-0 lead 57 seconds into the first period. . . . F Brooks Maxwell scored his 14th goal for Red Deer at 14:33 of the first. . . . Victoria G Coleman Vollrath, making his 100th WHL appearance, stopped 34 shots through OT, five more than Red Deer’s Rylan Toth. . . . The Royals (23-19-3) have won three straight. They visit Calgary tonight. . . The Rebels (25-14-6), who play host to Regina tonight, had won their previous five games. . . . In Prince George, F Chase De Leo’s shootout goal gave the Portland Winterhawks a 4-3 victory over the Cougars before 3,858 fans. . . . De Leo, who had a 17-game point streak end in a 6-2 loss in Kamloops on Wednesday, scored his 18th goal in the first period. . . . Portland F Miles Koules forced OT with his 19th goal at 16:54 of the third period. . . . The Cougars scored three first-period PP goals to take a 3-2 lead. . . . D Josh Connolly scored his seventh goal and added an assist for Prince George. 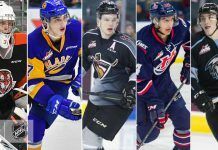 He was acquired from Kamloops last week with the hopes that he could add some life to the Cougars’ PP. . . . F Nic Petan and F Oliver Bjorkstrand each had two assists for Portland. . . . F Chase Witala scored his 24th goal for Prince George. . . . Winterhawks G Adin Hill stopped 31 shots, five fewer than Ty Edmonds of the Cougars. . . . Portland F Mitch Walter was among the scratches. 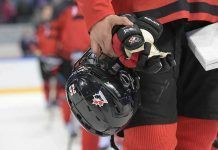 He left Wednesday’s game in Kamloops after taking a hard punch to the face in a second-period altercation. That was his first game with the Winterhawks since being acquired from Edmonton. . . . F David Soltes played his first game with the Cougars since leaving to play for Slovakia at the WJC. His father, sister and girlfriend took in the game from the Cougars’ corporate box. . . . The Winterhawks (24-19-3) moved into second place in the U.S. Division, a point ahead of Spokane, which has three games in hand. . . . The Cougars (20-23-2) have lost four in a row (0-2-2). . . . The same teams will play again tonight in Prince George. . . . The Cougars have drawn 63,787 fans to their 23 home games. Last season, their 36-game attendance total was 60,931. . . . In Kelowna, G Taran Kozun stopped 36 shots to lead the Seattle Thunderbirds to a 5-2 victory over the Kelowna Rockets. . . . Kozun was especially sharp in the first period when the Rockets held a 17-9 edge in shots. . . . Seattle came out of that period with a 2-0 goal. . . . F Roberts Lipsbergs scored his first goal since returning to the Thunderbirds from the ECHL’s Stockton Thunder. . . . Lipsbergs also had an assist. . . . Kelowna F Nick Merkley scored his 14th goal, at 6:39 of the second, to get the Rockets to within 2-1. . . . But Seattle F Cory Millette restored the two-goal lead 15 seconds later with his 11th goal of the season. . . . Kelowna F Rourke Chartier, who leads the WHL in goals, was scratched with a back injury. Larry Fisher of the Kelowna Daily Courier reports that Chartier is day-to-day “after getting hit from behind last game.” . . . Among Seattle’s scratches were F Mathew Barzal (knee) and F Alexander True (broken wrist). . . . Barzal, who hasn’t played since Nov. 4, is getting close to returning. True was injured on Tuesday. . . . The Thunderbirds (22-16-5) are 3-0-1 in their last four. They are in Everett tonight. . . . The Rockets now are 34-8-3 with six of those losses coming at home. They’ll have a lot of time to chew on this one as they don’t play again until Friday. . . . Larry Fisher of the Kelowna Daily Courier has a game story right here. . . . In Vancouver, G Evan Sarthou stopped 30 shots to lead the Tri-City Americans to a 3-0 victory over the Giants. . . . Sarthou, who has three shutouts this season, is the Americans’ starter with Eric Comrie out with an undisclosed injury. . . . F Ty Comrie scored his fourth goal at 9:19 of the second period and it stood up as the winner. . . . F Taylor Vickerman added insurance with his fifth goal at 12:40 of the third, via the PP, and F Austyn Playfair got his first career goal, into an empty net, at 19:06. . . . F Max James had two assists. . . . Vancouver G Payton Lee stopped 28 shots. . . . Vancouver F Thomas Foster took a kneeing major and game misconduct at 11:09 of the third period. . . . The Americans (21-21-2) had lost their previous two games. They entertain Spokane tonight. . . . The Giants (19-22-2), who are in Kamloops tonight, have lost two straight. . . . In Everett, D Ben Betker drew four assists to help the Silvertips to a 5-3 victory over the Spokane Chiefs. . . . Playing in his 174th regular-season game, Betker had never had more than two points in one game. He has 46 points, 11 of them goals, in his career. He now has a career-high 16 assists, two more than he earned all of last season. In his last 10 games, Betker has 12 points, including 10 assists. . . . The Silvertips scored the game’s first three goals, taking a 3-0 lead on F Matt Fonteyne’s fourth goal, shorthanded, at 7:40 of the first period. . . . That was the Silvertips’ first SHG of the season. They were the last of the 22 teams to score a SHG. . . . The Chiefs got to 3-2 before the period ended but were never able to equalize. . . . In fact, Everett F Jake Mykitiuk scored his first of the season at 14:37 of the first to restore the two-goal lead. . . . Spokane F Adam Helewka scored his 26th goal at 13:15 of the second period. He tied a franchise record with at least one goal in nine straight games. . . . Helewka shares the record with F Marian Cisar, 1997-98; F Brent Gilchrist, 1986-87; and F Terry Perkins, 1985-86. . . . Thanks to WHL Facts (@WHLFacts) for the info. . . . F Calder Brooks was among Spokane’s scratches. . . . The Silvertips (27-12-4), who are at home to Seattle tonight, have won three straight. . . . 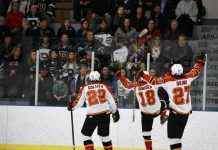 The Chiefs (23-16-4), who meet Tri-City in Kennewick, Wash., tonight, slipped into third place in the U.S. Division, one point behind Portland. Spokane does hold three games in hand.